In the remote Easter Island, we discover some of the places connected to moais, giant rock statues with human traits - from the quarry where the giant monoliths were extracted, to the village famous for the birdman ceremony, down to the majestic Ahu Akivi platform with its seven statues. 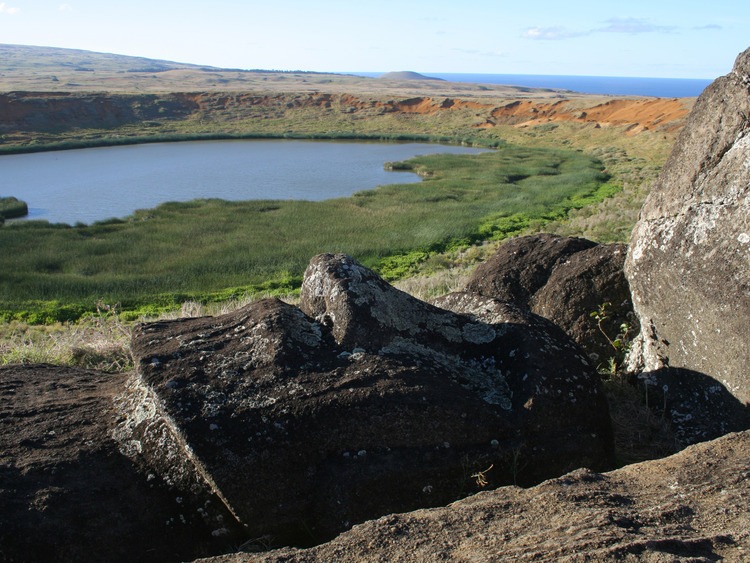 The excursion lasts all day and is the perfect occasion to explore Easter Island. Our day is divided into three sections - the Ranu Raraku site, the open-air quarry where moais were extracted and carved, the Ahu Akivi platform with its seven majestic moais. Ahu Tongariki platform, the most majestic of the island with 15 extraordinary moais erected as a sort of invincible army near the ocean. Only one still has the original headdress. In Ranu Raraku, we enter the quarry where the tuff blocks used to sculpt the moais, some sort of enormous rock heads, were extracted. We walk among hundreds of moais and see the different processing stages - some are still trapped in the rock, others are just outlined, and others are complete. The place emanates a mysterious magic and the least we can do is take a photo of this scenery unencumbered by the passing of time. We then move on the Ahu Akivi platform, which supports seven marvellous statues facing the ocean. The site is the only one where the moais, which are all identical, are arranged to face the sunset directly during the Spring Equinox and have their back to the sunrise during the Autumn Equinox. An oral legend says that the soul of the king saw Easter Island while floating above the ocean in a dream. When he woke up, the king decided to send some explorers to look for the island. The seven statues represent the seven explorers who, having arrived on the island, look towards the ocean waiting for their king. Our excursion ends with the marvellous beach of Anakea, with its white sand and tropical vegetation and where we enjoy a delicious barbecue lunch. If we want, we can take a dip in the cool and sometimes strong ocean waters. Do not forget to bring a hat and sun cream, bearing in mind the latitude. We recommend wearing comfortable walking shoes and to bring a waterproof jacket in the case of unexpected bad weather. If the tour departs from Anakena, guests can use the beach on their return from the tour.